-The project was introduced to us by our PI Nick Coleman as well as team member Alex Kelly, who introduced the project to Nick at a BioFoundry meeting. •This week the team discussed various insulin analogues on the market as well as a new type of analogue which is starting to appear in the literature. This ‘Single chain insulin’ keeps the C-peptide incorporated, resulting in greater stability. •We also discussed various expression systems for expressing our insulin. Steph suggested expressing insulin in yeast. This was thought to be too difficult as no one had much experience working with yeast. •Alex referred to several scientific papers that summarised the expression of insulin in the periplasm of E.coli - allowing for simpler purification of insulin. He also suggested purification using a His-tag fused to the protein. •Various assays to test our insulin were compared. We compared antibody assays (ELISA), cell culture glucose uptake assays, and an alternative C. elegans assay where the bioactivity of the insulin can be monitored through phenotype. •The team agreed that we wanted to stay away from mice convulsion assays due to ethical reasons. •This week, lead by our team legal expert Steph, the team looked at various patented single chain and other insulin analogues and summarised their features. We also looked through the patents for each of these insulins and to determine which features are covered in the patent. •We also discussed expression systems for our insulin analogues. Steph suggested using Bacillus subtilis to secrete our insulin if the protein was fused to a secretion tag. •This week our PI Nick inducted us into the lab. He introduced us to the other Honours and PhD students in the lab. We also met our team advisor Mark. •Our Secondary PI and protein expert, Jacqui Matthews, helped us design our own single chain insulin analogue which we called Winsulin. •The team narrowed down our research on insulin analogues and expression and finalised which parts we plan to submit into the registry and/or express. •We planned to express 3 different insulins: Human Proinsulin, a single chain insulin found in a paper called SCI-57, and our own single chain insulin Winsulin. •We plan to express each of these insulins in the cytoplasm of E. coli, the periplasm of E. coli and to be secreted by Bacillus subtilis. •Our parts each included a 6x His tag for purification. Insulins that will be expressed in the periplasm will have an Ecotin ‘periplasmic-expression’ tag, and insulins that will be to be secreted will be fused to a YncM ‘Bacillus-secretion’ tag. •This leaves 9 parts to be designed and synthesised. As a team of 8, each team member was assigned a part. Our lab guru Jamie was assigned two of these gBlocks to design as he was especially enthusiastic. •We hope to order them next week. •The team worked really hard last week to finalise our gBlock parts. Rough draft of the parts were made. Unfortunately, these still needed work. The team spent the week fixing up the minor details such as codon optimisation for E. coli and Bacillus subtilis and restriction enzyme recognition sites in our gBlocks. •Courtney started up our team social media pages (Facebook, Twitter, and Instagram) as well as our team email. •The team agreed to participate in National Science Week at the Australian Museum later in the year in cooperation with BioFoundry. •Fortnightly Skype meeting with Open Insulin Team! •Our PI Nick suggested designing our own E.coli/Bacillus shuttle replicative expression vector. However, we do not think that we will have time to construct it. This could be a plasmid we design for future USYD iGEM teams to construct. 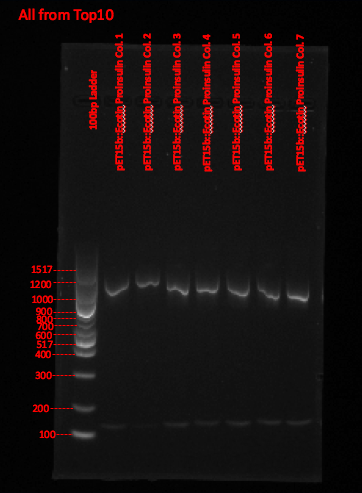 •Instead due to time constraints, our B.subtilis expression vector ended up being an integrative plasmid called pUS258, designed by Yanwei - a PhD student in our lab. Nick decided to use pET15b as our expression vector in E. coli. •The team explored various human practices approaches for the project, including researching various charity organisations that focus on insulin accessibility that we could get in contact with over the course of the project. •Emaleen suggested Health Action International and the 100 Campaign. •Alex suggested getting in contact with Insulin for Life. •Courtney suggested contacting the Australian government to discuss the Pharmaceutical Benefits Scheme which currently covers most of the insulin costs in Australia. •This week Alex prepared a flow chart as an overview of our project. This can be seen below. •Steph brought forward the idea of testing the functionality of our insulin using adipocyte cells in a glucose uptake assay and consulted a few insulin experts in other labs. •Sent emails to Health Action international and the World Health Organisation in attempts to hear their opinions on insulin inaccessibility world wide. •This week we finally placed the order with IDT for synthesis of our designed gBlocks! •This week we finally got started in the wet lab. With gBlocks still on the way, the 8 of us spent time making up the essential media needed for future lab work. •This included LOTS of LB broth, LB Agar, M9 minimal media, RF1 and RF2 etc. •Erica and Emaleen did plasmid preps on JM109 cells which contained our expression vector pET15b. •Jamie and Steph digested the pET15b stock and ran it on an agarose gel in order to quantify the concentration. •Fortnightly Skype meeting with Open Insulin Team! We were getting excited to show them our first results. •Alex and Jamie digested our pSB1C3 stock and ligated the cytoplasmic and Ecotin-tagged gBlocks into them. •Erica, Courtney and Grace transformed these vectors into TOP10 E.coli cells – colonies grew for each of the transformations. This was the start of our winter break – however, the team took advantage of the break and planned to get a lot of lab work done. •Grace and Emaleen performed a screening colony PCR on the transformations from last week for verification. •Ruby and Courtney ligated our Bacillus secretion gBlocks (YncM tagged) into pSB1C3. •Before transforming these vectors into TOP10 E.coli, we had to make a new batch of these cells competent. Alex was in charge of this. 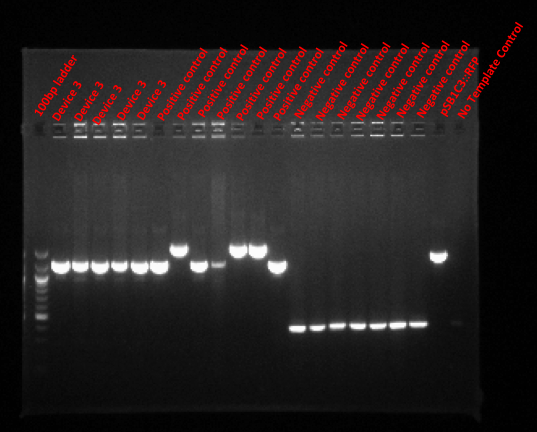 •Jamie redid the colony screening PCR on the TOP10 E.coli transformed with our cloned pSB1C3 vectors from last week in order to get a clearer gel. The results showed that Cytoplasmic Winsulin, Ecotin Winsulin and Ecotin Proinsulin in pSB1C3 need to be retransformed into TOP10 E.coli. •Steph transformed the pSB1C3 vectors with the YncM gBlocks inserted last week into TOP10 E.coli. These transformations did not work and we believe that it is due to a problem with the ligation of the gBlock into pSB1C3. 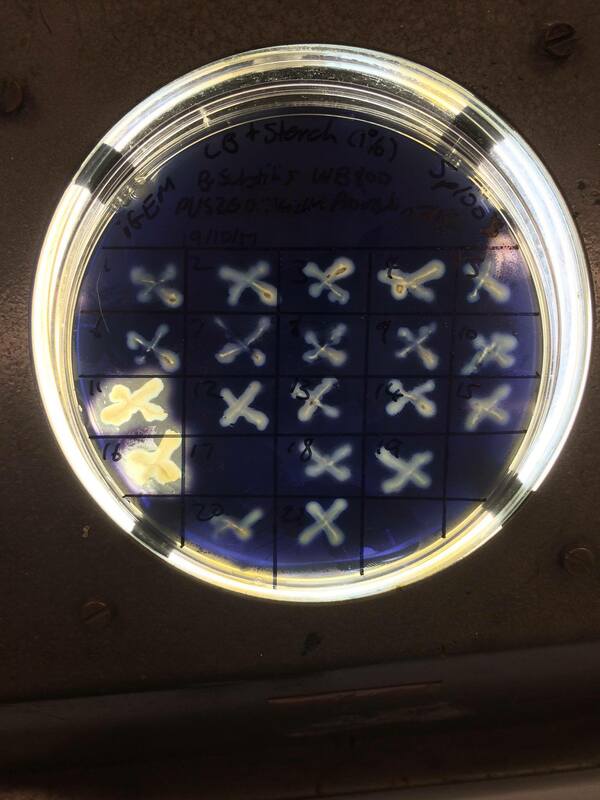 •Jamie redid the ligation of the YncM gBlocks into pSB1C3 and transformed these vectors into TOP10 E.coli. •Cytoplasmic Winsulin, Ecotin Winsulin and Ecotin Proinsulin were re-ligated into in pSB1C3 and transformed into TOP10 E.coli by Ruby. 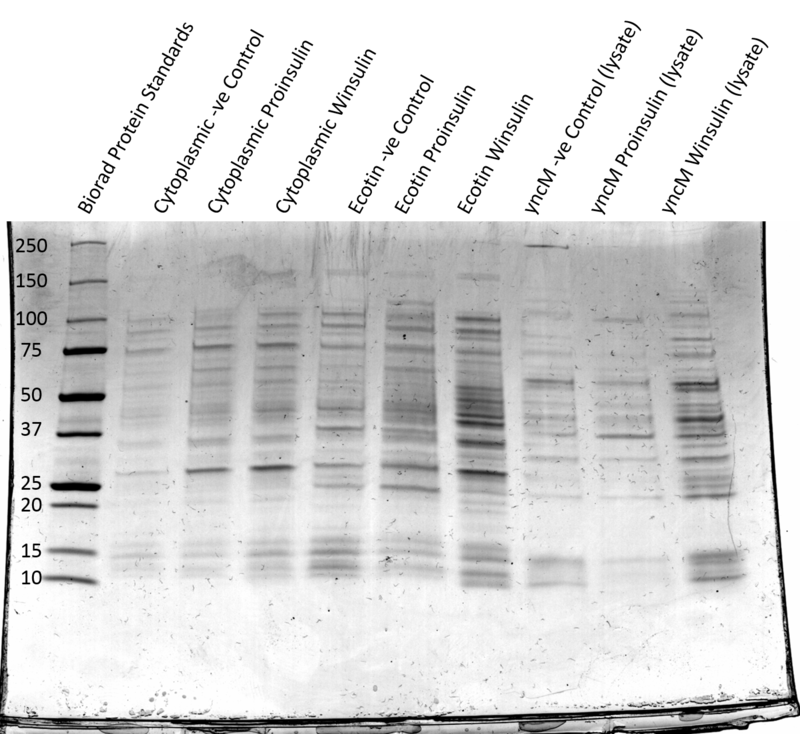 Ecotin Proinsulin and Ecotin Winsulin still didn’t appear positive on the agarose gel. •Erica and Alex reattempted transforming pSB1C3::Ecotin Proinsulin and pSB1C3::Ecotin Winsulin. These transformations worked! •This week was the first week of semester 2 and the team were all back from holidays and ready to continue work both in and out of the lab. •We received the WB800 strain of Bacillus subtilis which has 8 proteases knocked out. This was kindly donated to us by Sui-Lam Wang’s lab from the University of Calgary, Canada. 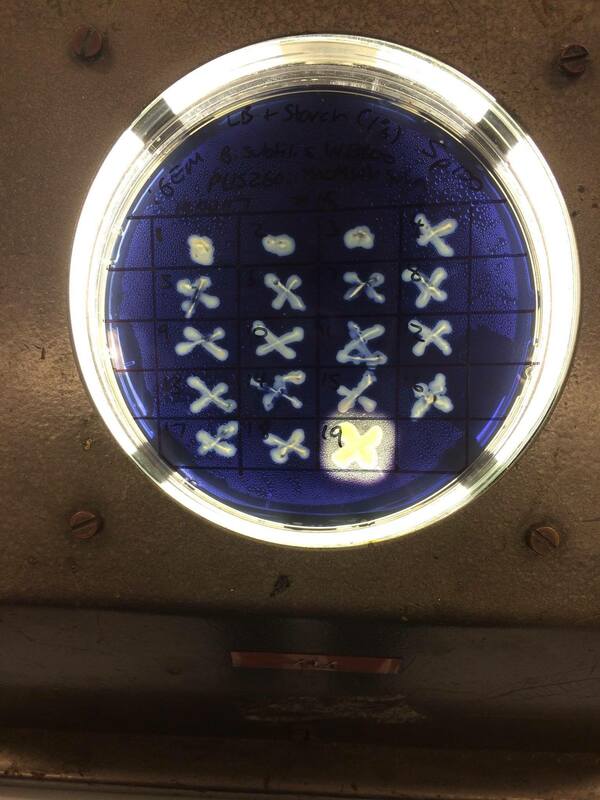 •Now that it appears that all 9 gBlocks in pSB1C3 have been transformed into TOP10 E.coli, Steph and Emaleen performed a colony screening PCR on a few colonies of each transformation to verify presence of the gBlock. 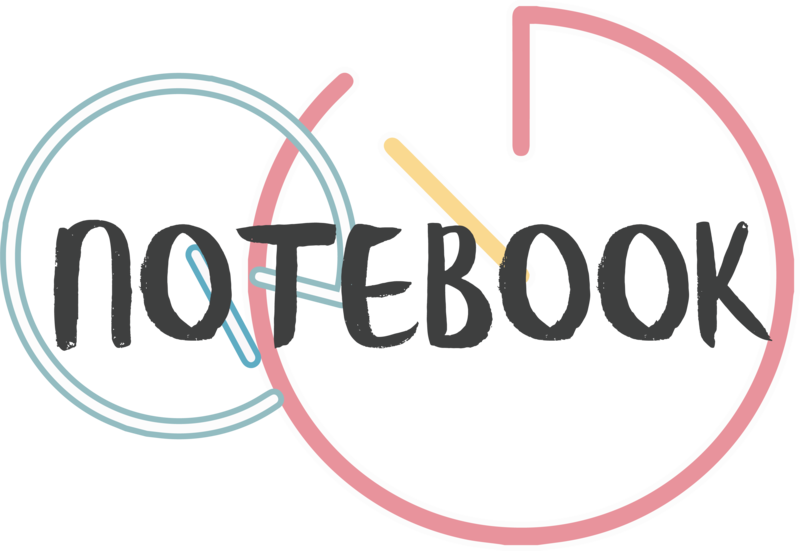 •Alex and Grace cloned all 9 Ecotin and Cytoplasmic gBlocks into pET15b. 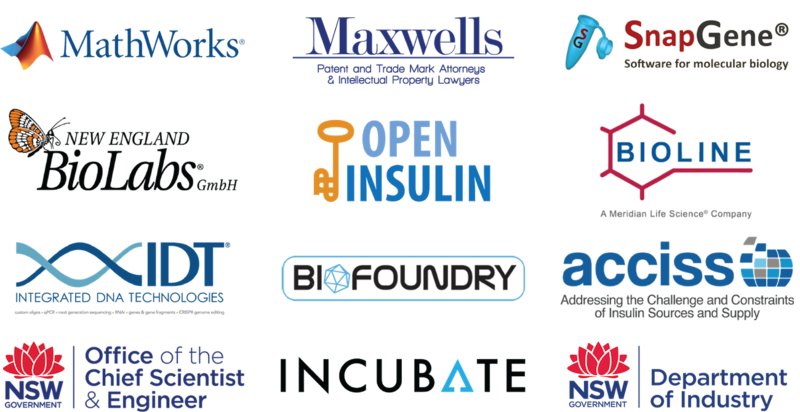 •Courtney emailed Insulin for Life for more detail on what they do and what they perceive to be the biggest problems contributing to insulin inaccessibility. •Fortnightly Skype meeting with Open Insulin Team started back up again! We had some excellent progress to show them. •Based on the colony PCRs from last week, Emaleen and Steph performed plasmid preps on those TOP10 E.coli which showed a positive result in the colony PCR last week. •Dr David Beran from Health Action International replied to our email asking for further information on the current issues with insulin accessibility. Alex organised a time to skype him later this month. •Grace wrote up an Insulin Accessibility Survey and made it public on our social media and the iGEM collaborations page. •The team took shifts at the Joint Academic Microbiology Seminars (JAMS) stall at the Australian Museum for National Science week. •Emaleen, Ruby and Grace performed double digests on the prepped pSB1C3 plasmids using the restriction enzymes EcoRI and Pst1. They then ran them on an agarose gel to confirm that the plasmid contained an insert before sending the plasmids off for sequencing. This had to repeated many times until we finally got a good gel. •Erica transformed the Ecotin and Cytoplasmic gBlocks that were ligated into pET15b in Week 13 into pET15b. These transformations were successful. •On the 18th of August, Steph participated in a webinar over Skype hosted by the Uppsala iGEM team. In this webinar, five teams discussed the ethics behind intellectual property and open-source science within the context of the iGEM competition. •The team continued doing shifts at the JAMS stall at the Australian Museum for National Science week. •Fortnightly Skype meeting with Open Insulin Team – this time joined by our new collaborator in Ghent! •pSB1C3::Ecotin Proinsulin and pSB1C3::Cytoplasmic Proinsulin came back with good sequencing results and these parts are now ready for submission into the parts registry!! •Alex and Courtney did plasmid preps on the positive TOP10 E. coli pET15b transformations from the colony PCR performed last week. •The team set up a microbiology stand at the University of Sydney Open Day where we spoke to future students about our experience doing science degrees. •This week we received advice from the university that we were at risk of infringing patents if we went on to express SCI-57 and Winsulin. We scrapped any work that had been done with these gBlocks. •Steph came up with a design for ‘Winsulin 2.0’ that would not infringe any patents. It was based on the design of Prof. Peter Arvan from the University of Michigan. We contacted him and he gave us permission to continue working with the sequence for Winsulin 2.0 in an open-source setting as he had no patent claims on it. •Courtney contacted a patent attorney, Len Mancini, who works at Maxwell's for advice about our newly designed Winsulin 2.0. •We performed double digests on the prepped pET15b plasmids from last week to verify insertion. We amplified the inserts of plasmids which, according to our double digests, contained the correctly sized inserts. These amplified inserts were then sent off for sequencing. •In the meantime, we transformed the pET15b plasmids into BL21 cells to start expression. These transformations were unsuccessful and will need to be done again. •Alex Skyped Dr David Beran from Health Action International to discuss the ACCISS reports and his research on insulin accessibility. It was an extremely productive and informative discussion. •Sequencing from last week was entirely bad quality. We determined to send off PCRs rather than whole plasmid, so Jamie amplified the inserts in the pET15b vector and sent them off for sequencing again. •Courtney also redid the transformations of pET15b-gBlock into BL21, as they didn’t work last week. This time we finally got some successfully transformed cells! 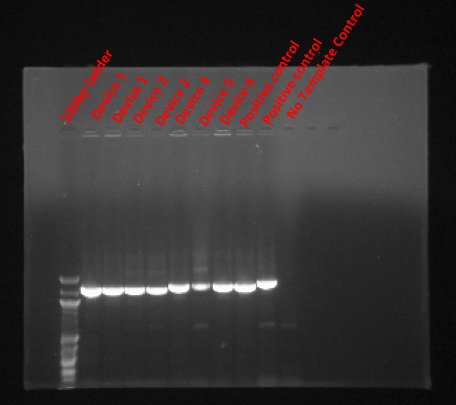 •Emaleen performed colony PCR on these transformants and correctly sized bands were seen. We hope to start induction next week. •Courtney, Grace, Emaleen and Jamie gave a talk about iGEM and our project at an event hosted by the USYD Biomod team. These excellent scientists are entered in the Biomod competition which focuses on biomolecular design. •Alex made competent DH5α cells to use in the Interlab study. •We received new primers that bind either side of the gBlock inserts in pET15b. •Alex did IPTG induction on BL21 cells transformed with pET15b containing Ecotin and Cytoplasmic gBlocks. •Courtney called Neil from Insulin for Life to discuss what goes on behind the scenes at their organisation and to learn about the struggles of sending insulin to impoverished countries with poor distribution systems. •Emaleen and Erica performed the fluorescence and OD600 readings on the cells for the Interlab study and submitted last minute on Friday! •Courtney and Alex cloned Ecotin-Winsulin 2.0, YncM-Winsulin 2.0 and Cytoplasmic-Winsulin 2.0 into pSB1C3 and transformed them into E.coli TOP10, while simultaneously performing the ligation into pET15b. •Steph and Grace transformed pET15B::Cytoplasmic-Winsulin 2.0 and pET15b::Ecotin-Winsulin 2.0 into TOP10 E. coli. •We ordered precast SDS-PAGE gels as our own gel casting skills left a lot to be desired. •Erica and Alex performed colony PCRs on the pSB1C3 and pET15b plasmids transformed into TOP10 E.coli last week. •Jamie sent some pSB1C3 submission vectors, some pET15b E. coli expression vectors, and the pUS258 B. subtilis expression vectors off to sequencing to verify correct gBlock insertion. Got verification of correct insertion so that we can progress with submission into the parts registry and also verification that we have the correct inserts in our expression vectors. •Alex performed autoinduction on our BL21 cells transformed with our pET15b expression vectors with with our Cytoplasmic and Ecotin gBlock inserts. •He then did periplasmic chloroform extraction for the cells transformed with the Ecotin constructs and cytoplasmic extraction for those with the cytoplasmic constructs and ran them on an SDS-PAGE gel. We did not get conclusive results from this method, partly due to a disputable negative control. Will go back to IPTG induction. •Grace, Alex and Emaleen met with USYD bioethics expert Dr Narcyz Ghinea who specialises in the ethics behind high cost medicines. We discussed issues with how medicines are priced and the costs of going through clinical trials. •We were visited in the lab by a group of year 10 girls from Mt St Benedicts school. Our PI Nick spoke to them about microbes in our environment and Ruby, Grace and Emaleen taught them how to gram stain and use a microscope. •Emaleen and Grace made competent B. subtilis WB800 cells. •Erica and Jamie transformed our sequence verified pET15B with Ecotin tagged gBlocks into E.coli expression vectors into BL21. •We decided to express the cytoplasmic gBlocks in the SHUFFLE strain as this strain will aid in the folding of cytoplasmic proteins. •Grace continued to run SDS-PAGE gels on our induced cell lysates for insulin detection. •We received the last of the sequencing data which correctly verified our gBlocks were correctly inserted into pSB1C3. •Jamie did one final double digest for our parts and found that 5/6 of them were able to be submitted. YncM proinsulin could not be submitted as the double digest resulted in multiple bands. The parts were sent off on the 27th of October. •Jamie, Emaleen, Ruby and Steph performed an ELISA and glucose uptake assay on our cell lysates. •The sandwich ELISA test detected insulin in the induced cell lysates expressing parts Cytoplasmic Proinsulin, Ecotin Winsulin, Cytoplasmic Winsulin and YncM Winsulin. The visible colours that appeared at the end of this ELISA was single handedly the most exciting moment of this project. •The Glucose uptake assay showed some increased activity, however we were hesitant to draw a strong conclusion from this before showing to some experts. •The team met with Mike Nicholls at the USYD start up hub Incubate as well as Main Sequence Ventures to discuss the future of our project.